Companies Siemens d.o.o. Belgrade and Telegroup d.o.o. Belgrade signed a Memorandum of Understanding with which two companies will cooperate in future on projects in the field of transport, industry and energy. The signatories of the agreement recognized the opportunity to pool capacities and expertise in order to work together in common areas of the market, related to possible future projects in the areas of smart cities in Serbia, automation projects and projects in the field of IT and telecommunications. 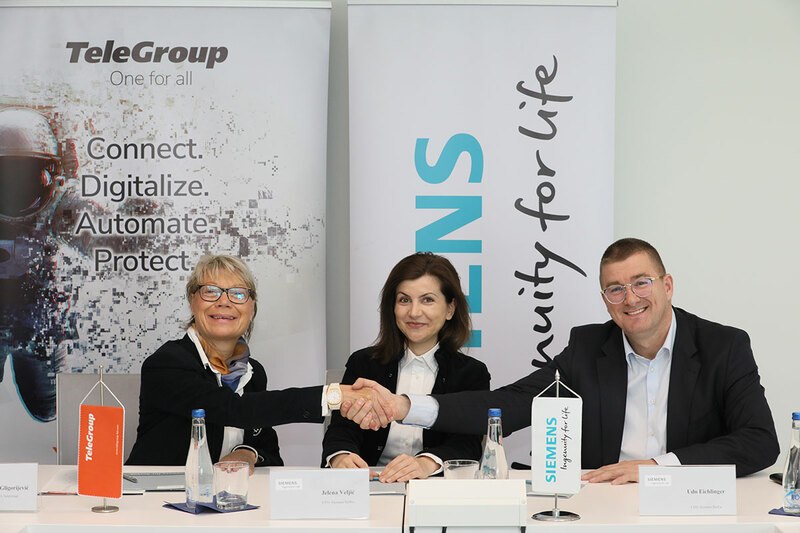 The signing of the contract was held at the premises of Siemens Serbia, and the contract was signed by Udo Eichlinger, General Manager of Siemens d.o.o. Belgrade and Jelena Veljić, Deputy Director Siemens d.o.o. Belgrade, while Diana Gligorijevic, member of the Executive Board, executive director of marketing, TeleGroup, signed the memorandum on behalf of TeleGroup. “Our company in Serbia and the world is known for the latest solutions and services in the fields of energy, industry and transport. We are a pioneer in the field of digitization, and our goal is, besides promoting this topic, to present our customers new products and solutions that can improve their business and market status. I am very pleased with this type of cooperation and what future projects will have partners such as TeleGroup, “said Udo Eichlinger, General Manager of Siemens d.o.o. White City. Siemens has been present in Serbia for 132 years and is making a key contribution to the implementation of capital investments in Serbia and is a symbol of innovation, quality, reliability and engineering excellence with its partners in Serbia. “We are honored that Siemens recognizes the expertise, quality, reliability, versatility of the services we provide, as well as the complexity of implementing the most up-to-date technologies that are important for improving the quality of work and life in general. Having an active role in the technological changes that are taking place and the implementation of digital transformation both in our company and in the economy of our country, we recognize the challenge of the role that we are and will be in the future the continuing partner of Siemens both in Serbia and in the countries in the region where we operate ” , said Diana Gligorijevic, a member of the Executive Board and executive director of marketing, TeleGroup.